Ford Motor Company is undergoing a transformation from nuts-and-bolts automaker to something that more closely resembles a tech company, and this week, the company offered press tours of its $45 million Advanced Manufacturing Center in Redford, MI. The center, meant to be a sort of digital test bed, didn’t look at all like a traditional manufacturing operation: it was an immaculate, gleaming open-plan space full of 3D printers of varying sizes, virtual- and augmented-reality stations, and lots of robots. One even greeted people at the front door. Mike Mikula, Ford’s (NYSE: F) global chief engineer of manufacturing and infrastructure, told those on the tour that about 100 employees work at the building. The equipment installed across its 100,000-square-foot floor plan includes 23 3D printers made by 10 different companies, he said. Ford uses 3D printers to experiment with different advanced materials and polymers or to make prototype parts before producing them in large quantities. Harold Sears, Ford’s technical leader for additive manufacturing, said that Ford has been involved with 3D printing since the 1980s and now has 60 professional-grade manufacturing systems at 30 facilities. Sears gave us a first look at 3D-printed brackets that will go on the Shelby GT 500, a sports car that will debut at Detroit’s North American International Auto Show in January. Three-dimensional printing is saving Ford money by increasing efficiency, Sears added, while helping printer makers find new applications for their technology. “The objective is to raise production volume,” Mikula added, noting that Ford is testing a system that can print using multiple materials at the same time. Mikula said Ford can print its own pieces for one-third of the cost of buying them, and 3D printing is critical to doing multiple iterations of parts without injection molding. Under the old system, a supplier would need 12 to 28 weeks lead time to make a new par. With 3D printing, he said, Ford can make a new part within 48 hours. Many 3D printers only work with proprietary materials made by the same company, but Mikula said Ford is testing an open materials system by Voxeljet that doesn’t require buying a specific material from a device manufacturer to work. The Voxeljet system Ford uses is not yet available to the public, he said. Also on display at the Advanced Manufacturing Center were an array of collaborative robots that can work with humans on manufacturing-related tasks. Ford says it’s currently using about 100 of them at two dozen plants across the world. One is in use at the Livonia Transmission Plant for work so ergonomically challenging that humans could only do it for about an hour at a time, according to the company. As part of the manufacturing center tour, reporters wore Microsoft (NASDAQ: MSFT) HoloLens headsets to see how learning to build a part in augmented reality (AR) compared to the experience of learning how to build a part with written instructions. The paper instructions were very confusing and made one wonder why anyone would use them if they had access to AR. Mark Goderis, a digital engineering manager at Ford, said the automaker uses AR and a library of 3D images for unlimited global collaboration and training, enabling co-workers in different countries to work together in a shared digital space or train virtually before their feet hit the factory floor. Ford is also using AR to provide custom information quickly. Say someone has a question about a task they’re working on; they can send the question to an engineer, who can then answer it by exporting an Excel file that the questioner can watch on the HoloLens. “We can provide information to individuals with specific needs—they all need different information on the same equipment at different times,” Goderis said, adding that he expects AR to be used more widely next year at Ford plants and engineering centers. The highlight of the tour for this reporter was working on a factory line in virtual reality (VR), where it was revealed that even VR avatars wear hard hats at Ford. The controllers had speeds like walk and teleport, with laser pointers so workers can communicate and point to what they’re talking about. 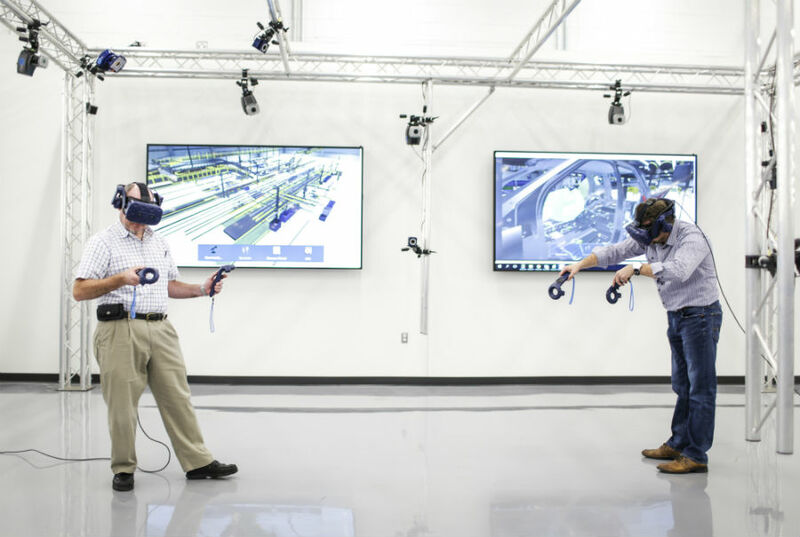 The automaker plans to increase use of VR to identify potential hazards and fine-tune workflows before an assembly line is built, it said in a press release.